Wow. There’s a lot packed into this adventure, from social commentary on ordinary human problems to the extraordinary possibilities of Doctor Who space opera. Merseyside is your average 1991 seaport near Liverpool. The town’s shipping industry has gone into a tailspin, more and more people are out of work, the wealth gap between classes is widening— gosh, this all sounds familiar. But now a new employer has bought the shipyard and started to turn things around, providing jobs to the local population. A good-news story, right? Perhaps, but it’s hardly the sort of mundane story Ace signed on for. She wants to go somewhere more exciting (read: alien). The Doctor, however, has guessed there’s something afoot even before they learn the ominous name of the shipbuilding company. Meanwhile, Mel has discovered her old boyfriend is involved in the project. Delighted to see her, he offers her a chance to get back to the career she originally trained for: helping traditional companies make the jump to the computer age. Again, all much too boring for Ace. But is Mel ready to hang up her spacefaring shoes and get back to a semblance of real life? Carolyn: I think we should toast this new appointment. Melanie: You… have a bottle of champagne in your bag? Carolyn: Now. Melanie, may your talent turn to our true purpose. With the Doctor around, of course, “real life” will have to go on hold until the current mystery is solved. 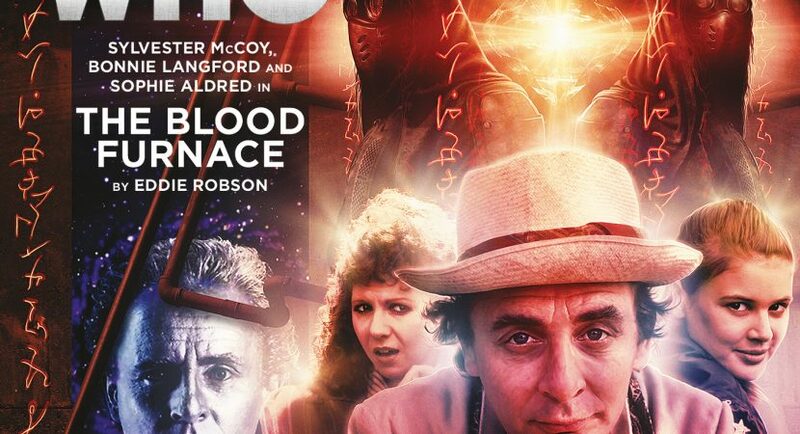 Sylvester McCoy seems comfortable in this story, ambling along halfway between the amiable, eccentric, and “mostly harmless” do-gooder of season 24 and the more calculating Chessmaster of later Big Finish. Mel is once again thriving in her Big Finish expansion, letting her flex her geek skills and general competence rather than her lungs. Ace is a little hard to pin down: this does seem to be meant as post-Hex, although I still feel like it’s closer to The Fearmonger, when she was starting to become the Doctor’s pawn in his more machiavellian plots but had not yet faced quite so many soul-wrenching heartbreaks making her a grizzled veteran. She seems to have reverted to an earlier phase of her personality in this and the other Mel-stories. I think they’re a soft reboot. At any rate, they just “click” as a TARDIS team, and I’m glad somebody thought of a way to give them a second chance. What sets this story apart are the ordinary, flawed humans who provide comprehensible context, real-world stakes and sympathy. In the UNIT era of classic Who, these “rude mechanicals” tended to be rural: cottagers and poachers, miners and schoolteachers, housewives and rank-and-file soldiers. Updated for the early 90s, they’re machinists and police sergeants, computer geeks and workers playing arcade games on their lunch breaks, power-dresser corporate execs and single mom-to-bes who just need a job. The guest actors for all these parts inject emotion and humanity into the drama. Unlike Ace and Mel, they are not used to the sort of dangers the Doctor deals with on a daily basis, and they lose their tempers or their nerve or the green folder with the personnel files. There’s so much packed into this story— much of which I’ve omitted to avoid spoilers— that a few threads are abbreviated or hand-waved. Mel makes one snap decision that surprised me, although she admits it’s spur-of-the-moment. There’s also one character who has quite a large role early on who drops out of the story partway through with a perfunctory wrapping-up of their storyline. But these are minor quibbles. I really enjoyed Blood Furnace: good villains, good guest characters, good climax, multiple themes, excitement and horror, and lots for all three TARDIS regulars to do. Between Time in Office in September, this story in August, and All Hands on Deck in October, not to mention The Five Companions and various other past BFAs, author Eddie Robson has impressed me with his ability to turn out great scripts for audio and write classic companions well. Okay, now I can be a little more specific and spoiler-ish. I know that militant alien conquerors and organic technology are hardly groundbreaking in the annals of SF. And their magical incantations reminded me strongly of the sigil-wielding aliens in Cold Fusion. But still, they were a great new alien species, and some of the imagery of the gateway and the bloodthirsty ship were truly inspired. (Again parallels: a spaceship like a boat was the star of my very favourite childhood anime, Star Blazers). And Carolyn was a lot of fun, affable and charismatic, almost “reasonable,” as she said, despite being a megalomaniac at heart. Unlike most evil overlords, she was effusive in her praise of her hapless human minions, expressing delight at their craftsmanship, reveling in the barbarism of what to her was a very primitive design, and having a jolly old time blooding her ship for its launch. The casual cruelty of turning pursuing helicopters into birds was both macabre and magical, like a lot of the alien tech in this story. And I was impressed at Julie Graham’s sustained evil cackles— they’re so passé that’s it’s almost impossible to pull them off anymore outside of children’s cartoons. But she was fun. I’ve gotta geek for a moment, because I was a computer geek girl and gamer in 1991, and it’s a uncomfortable yet fascinating sensation to feel the beginnings of a “vintage” patina creeping across your memories. That fighting arcade game felt more like late-90s gaming, but I was engrossed in college at this point and may have missed whatever came after Joust and Gauntlet and Pole Position. Also— good gods, arcade games cost a quid?! They were 20p in 1984 when I spent a summer touring England. How time flies. On the other hand, I experienced the early 90s through the rosy glasses of a pampered college student during the beginnings of the American tech boom, oblivious to the kind of economic hardship this audio portrays so well. The same sorts of layoffs were probably happening in the industrial outskirts of Philadelphia right near me, or in the port of Baltimore where my grandparents lived, as well as in many of the places I visited in England as a young tourist 7 years earlier. Speaking of hard-hit port towns— this is a clumsy segue — The Blood Furnace‘s fictional setting kept reminding me of the real-world situation in Ramsgate, the seaside town where Janet Fielding (Tegan) lives. It, too, went through a major economic downturn with a whole generation of young people growing up with chronic unemployment and hard times. So Janet has been throwing her formidable willpower and executive skills behind a different kind of project, trying to renovate an abandoned museum and dilapidated structures near the harbor, creating space for new shops, theatres and small businesses that will provide jobs and job training for local youth. I mention Ramsgate because on the one hand, it’s in a somewhat similar situation to Merseyside in this audio, and I couldn’t help wondering whether author Eddie Robson had it in mind or was just riffing on a problem found in many towns across the UK. And on the other hand, in the real world, I think Project Motorhouse is a great idea worth supporting. You’ll pardon my drawing attention to it on a Who blog, since a lot of Who actors (including both Peter Davison and Peter Capaldi) have helped Janet with fundraising. I just hope she manages to steer clear of less benevolent alien backers than the Doctor.